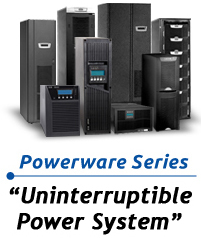 Uninterruptible Power Systems (UPS) Technology Which UPS Is Right For My Systems? Eaton's approach to power protection revolves around the 9 most common power problems present in any work environment. You can choose form a variety of power protection devices with varying levels of effectiveness and price that will shield critical data and equipment from some or all of the 9 power problems. There are three types of Eaton UPS: Eaton Series 3, Eaton Series 5, and Eaton Series 9. To choose the UPS that is right for you, first determine the level of power protection that is needed. It is obvious that the ideal is to provide the full protection from all power problems afforded by a Eaton Series 9 UPS. But there may be applications where power quality is known to be high, or where the load is not considered critical, or where budget considerations force a compromise. Eaton Series 3 UPS are standby or off-line designs that are intended to provide a low price solution for power failures, power sags and power surges. Utility power is provided during normal operation. Utility voltage and frequency changes are not regulated by Eaton Series 3 UPS, and pass through to the equipment. When voltage or frequency changes become too severe, Eaton Series 3 UPS inverter converts DC battery power to AC power to run the equipment. Eaton Series 5 UPS offer line-interactive technology and provide basic power protection at mid-range prices. In addition to protection against power failures, power sags and power surges, Eaton Series 5 protect against brownouts and electrical line noise. This design offers low-grade voltage regulation by "bumping" the utility voltage up or down before passing it through to your electronic system. During the UPS voltage changes, Eaton Series 5 use the battery for regulation. Although line-interactive UPS provide more voltage regulation than Eaton Series 3 UPS, battery life is often sacrificed. The number of transfers to and from battery by Eaton Series 5 UPS exceeds that of the Eaton series 9 by as much as 10 to 1 during brownouts and power surges. Eaton Series 5 offers additional power protection at a competitive price. Eaton Series 9 UPS is designed to provide complete power protection. 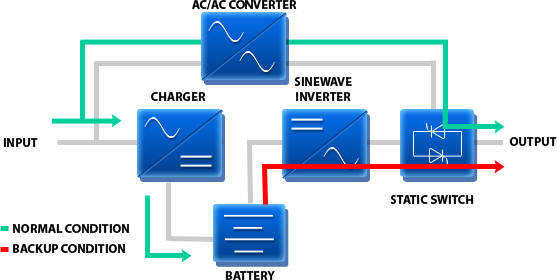 These On-line UPS protect against all types of power problems and continuously use the inverter to create 100% new, clean, regulated AC power for your systems. Equipment is isolated from all types of power problems when supplied by an on-line double conversion UPS. Eaton Series 9 UPS isolate equipment from harmonic distortion and are strongly recommended for critical applications that must meet the 5% maximum harmonic requirement stated in major computer manufacturer specifications and installation guides. Battery conservation is an essential factor in your decision to purchase an Eaton Series 9 UPS. Eaton Series 9 UPSs , use the battery less than any other UPS technology, increasing the life of your UPS.